New data from the U.S. Census Bureau showed good news for Americans in 2016: Household income is up, poverty is down, the gender pay gap narrowed, and healthcare coverage expanded. This sunny outlook does come with a few clouds, though. Here are three trends in the data that put 2016 report in context. Household income has increased for the second year in a row, but earnings growth is still slow. The wages Americans earn have not increased, rather income gains are being driven by rising employment levels and more combined paychecks in each household. Income levels still haven’t returned to the levels seen before the financial crisis. Last year, median household income in the United States was $59,039 — lower than the $59,992 median in 2007 or the $60,399 median income in 2000 — based on calculations by the Economic Policy Institute using Census data. “I fully expect, with another year of strong growth in household income, we will be back to pre-2007 levels,” said Elise Gould, senior economist at EPI. The percentage of Americans living in poverty has fallen for the second year in a row, but is still slightly higher than in 2007 and still 1.4 percentage points higher than in 2000. 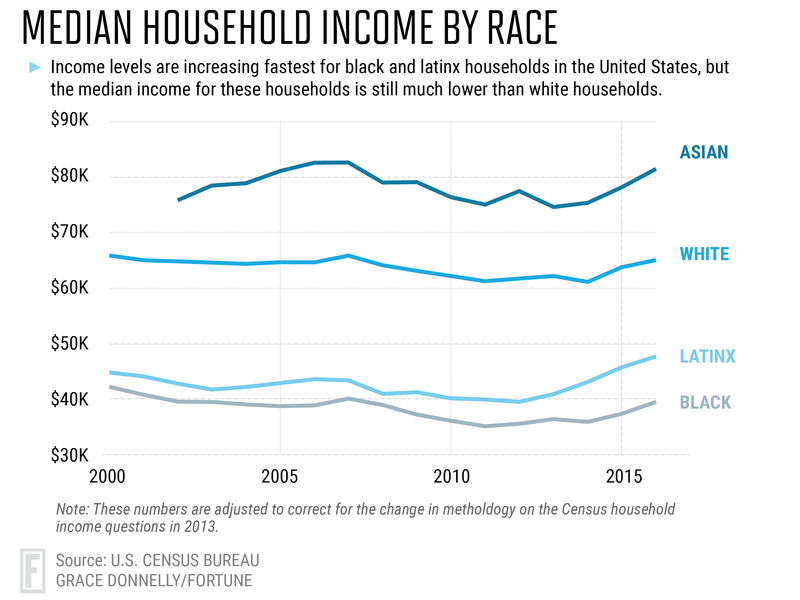 Income has grown fastest for Black and Latinx households for the second year in a row. Black households saw a 5.7% increase, while Latinx household income grew by 4.3%. Asian households saw a 4.2% increase and non-Hispanic white household income increased by 2%. This narrowed the racial income gap between these households and their white counterparts. Black households now earn 61 cents for every dollar in a white household and Latinx households earn 73 cents on the dollar, up from 59 cents and 71 cents, respectively, in 2015. Though poverty rates decreased in 2016, they remain highest for black and latinx households. The poverty rate dropped to 22% for black Americans and 19.4% for Latinx Americans — both significantly higher than the average U.S. poverty rate of 12.7%. The rise in household income is being driven by job growth, but most of this new work is in low-paying positions. 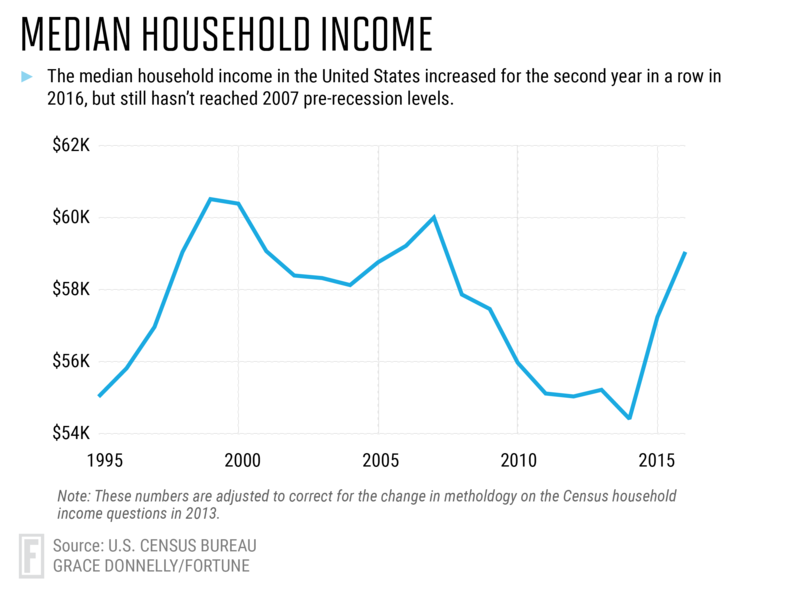 While incomes are increasing, lower income households aren't recovering as quickly. 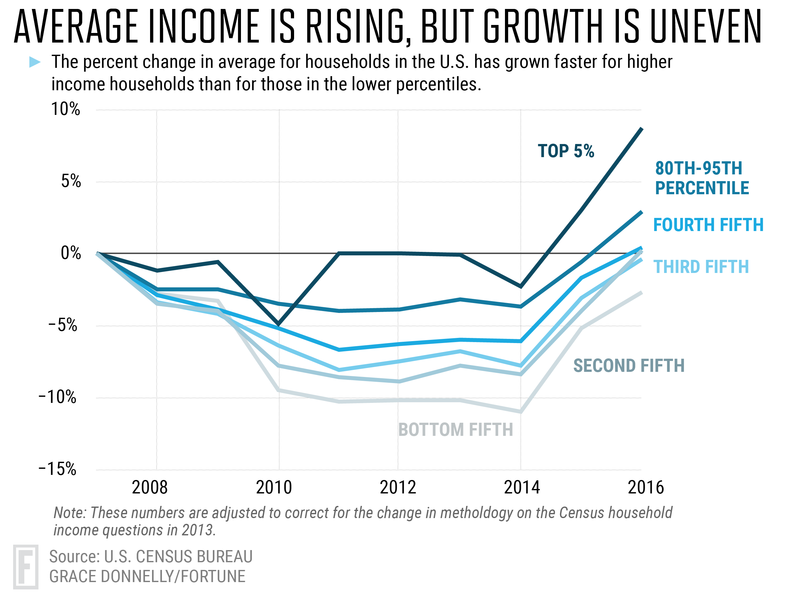 The top 5% of earners are seeing their income grow the fastest, with median incomes 8.7% higher than pre-recession levels. The bottom fifth of the population has yet to reach pre-recession levels. Incomes for this segment of the population remain 2.7% below pre-recession incomes. The EPI economists say one more year of normal income growth should restore incomes in the middle-fifth to their 2007 levels.